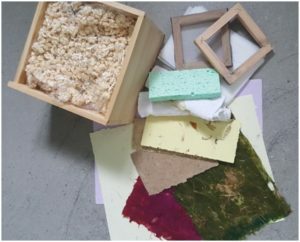 We start with some demonstrations and handling of different sorts of papers, an historical overview of paper usage and a discussion about raw materials before moving on to practical paper-making. We incorporate Health & Safety considerations. All ingredients and equipment are provided. We cover basic techniques, use of moulds and deckles, testing and trialling techniques, as well as more advanced options such as embedding and colouring. Participants will be able to make and trial their own products to take away. The second part is tailored to meet the needs of participants. It can focus on the development of further practical skills and different techniques. There is also an opportunity for group discussion about sustainability issues, ways of incorporating processing technologies in the classroom, unpacking a standard, scaffolding learning, writing specifications with students, assessment and moderation issues or whatever focus the group decides they would like to have. Split workshops ( e.g. 2 half days, weekends etc.) workshops outside this region and larger numbers subject to negotiation to accommodate travel and increased use of consumables.